Investors like to see a “Mission Statement” for startup companies – something short and sweet, something that checks all of the politically correct boxes, and incorporates the trendiest business phrase of the month. A perfect, digestible, double-digit IQ blurb. Unicorn doesn’t have that. Disruption is complicated, and our mission is truly multi-fold – something that requires an intellectual discussion well above the 120 IQ level. The mission, broadly, is to mirror the benevolence of the mythological unicorn. I created Unicorn, Inc. to help pets live happier, healthier and longer. But Unicorn is not just about the health and longevity of companion animals. 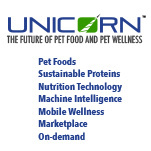 The Unicorn Ecosystem was purpose-built to help reverse, or at the very least, slow dow the damaging environmental impact caused by livestock and farm raised poultry – the two major protein sources used for the production of pet food. We’ve pioneered a production system that ensures that we manufacture the exact amount of food our pet “customer” require – no shortages, and no waste. Plus, we’re in the formulation process as I write this for a proprietary line of pet foods build on non-meat proteins. A 2016 US pet obesity study he Association for Pet Obesity Prevention (APOP) found that 54% of US dogs, and 59% of US cats are overweight or obese. Of the nearly 200 million companion dogs and cats in the US, that corresponds to 42.9 million and 50.5 million respectively. Obese pets die up to 2-1/2 years earlier than their healthy weight peers, will experience the same types of obesity related illnesses and diseases as humans, and will cost their owners an average of $4,000 to $7,000 for veterinary care. Sadly, their last few years of their shortened lives will be miserable – they will suffer a prolonger health decline. Unicorn’s system is designed to reverse obesity in overweight pets and prevent 100% of every pet dog and cat on our system from becoming obese. Period. There’s not a single competitive pet food manufacturer in the world that can lay that claim. None. And, there’s not a single veterinarian who can guarantee that any prescribed pet food will accomplish what Unicorn will do. And the economic impact of Unicorn’s system? We performed an internal study that showed that excess revenue generated by the excess pet food consumed by obese pets was nearly $2 billion annually. And, industry data shows that approximately 40% of the revenue generated by the $16 billion pet care industry (veterinarians, pet pharmaceuticals) is directly attributable to pet obesity. Together, Unicorn intends on putting a big dent into the $8 billion or so revenue generated at the expense of obese pets. The company is complicated, as are its technologies, systems and methods. They are all intertwined to carry their respective loads like each cable on the Golden Gate Bridge. I mentioned in an earlier blog that I dislike the notion of a “Eureka” moment. Complicated puzzles are not created in a “moment”, and so far, the Unicorn system has consumed 3 intense years of work, and re-work, scrapping approaches only to rebuild them differently. This time, there’s a multi-mission, and a clear end game, one that I’ve envisioned, and virtually experienced in some future time – and I’ve looked back to see how I got there. Creating a forward looking road map using 20-20 hindsight is easy, and along with my multi-startup team, we understand well that although we know the direction, we are already anticipating the pot holes. I suspect the obesity issue is less about portion control at meal time and more about the treats and supplemental food added throughout the day. The issue gets compounded with multiple pets in one household and eating habits (grazers vs.hoovers) but since the pets don’t generally serve themselves, you need to condition the human more than the pet. Daniel – good thoughts. To answer your last question first: Anecdotal “evidence” from executives at various cricket & fly protein production facilities is that their dogs love the protein meal – lap it up instantly. Most pet foods (kibble) have a fat-based flavor coating added as a final production process – palatants – like those sold by afb international. Oddly, I ask why a palatant needs to be added to chicken / beef protein based pet foods if pets like beef and chicken. Indeed, pets get treats perpetually – one of our solutions is to have the owner enter treat nutrition info into an app (one time). Then, at the end of every day, the app opens and asks the owner to tap the number of treats given. This data is incorporated (as a predictable trend) into the next daily food production for that pet. So, even with treats, our solution endeavors to reduce food calories to end each day with an optimum treat + food calorie total. The notion that the APP makes owners increasingly conscious of treat volume may ultimately “train” the owners – some of the empirical data that we will analyze once the installed base our the Unicornpets.com system is statistically large (reliable) enough. Depending on whether insects are farmed or taken from nature, this could be a significant contribution to the ecosystem. However, we have over-fished the oceans to the point of near exhaustion; would feeding pets on insect protein do the same for the atmosphere? Insects only become a source of protein by eating. Will their shortage from the atmosphere have impact on the ecosystem? Screw up the balance? These seem like basic issues about which you no doubt have covered. Still, there is concern. But the premise is commendably novel and promising.